B Light pollution—the artificial light that illuminates more than its intended target area—has become a problem of increasing concern across the country over the past 15 years. In the suburbs, where over-lit shopping mall parking lots are the norm, only 200 of the Milky Way’s 2,500 stars are visible on a clear night. Even fewer can be seen from large cities. In almost every town, big and small, street lights beam just as much light up and out as they do down, illuminating much more than just the street. Almost 50 percent of the light emanating from street lamps misses its intended target, and billboards, shopping centres, private homes and skyscrapers are similarly over-illuminated. D But don’t we need all those lights to ensure our safety? The answer from light engineers, light pollution control advocates and astronomers is an emphatic “no.” Elizabeth Alvarez of the International Dark Sky Association (IDA), a non-profit organization in Tucson, Arizona, says that overly bright security lights can actually force neighbours to close the shutters, which means that if any criminal activity does occur on the street, no one will see it. And the old assumption that bright lights deter crime appears to have been a false one: A new Department of Justice report concludes that there is no documented correlation between the level of lighting and the level of crime in an area. And contrary to popular belief, more crimes occur in broad daylight than at night. F Badly designed lighting can pose a threat to wildlife as well as people. Newly hatched turtles in Florida move toward beach lights instead of the more muted silver shimmer of the ocean. Migrating birds, confused by lights on skyscrapers, broadcast towers and lighthouses, are injured, sometimes fatally, after colliding with high, lighted structures. And light pollution harms air quality as well: Because most of the country’s power plants are still powered by fossil fuels, more light means more air pollution. G So what can be done? Tucson, Arizona is taking back the night. The city has one of the best lighting ordinances in the country, and, not coincidentally, the highest concentration of observatories in the world. Kitt Peak National Optical Astronomy Observatory has 24 telescopes aimed skyward around the city’s perimeter, and its cadre of astronomers needs a dark sky to work with. H For a while, that darkness was threatened. “We were totally losing the night sky,” Jim Singleton of Tucson’s Lighting Committee told Tulsa, Oklahoma’s KOTV last March. Now, after retrofitting inefficient mercury lighting with low-sodium lights that block light from “trespassing” into unwanted areas like bedroom windows, and by doing away with some unnecessary lights altogether, the city is softly glowing rather than brightly beaming. The same thing is happening in a handful of other states, including Texas, which just passed a light pollution bill last summer. “Astronomers can get what they need at the same time that citizens get what they need: safety, security and good visibility at night,” says McDonald Observatory’s Mark Adams, who provided testimony at the hearings for the bill. I And in the long run, everyone benefits from reduced energy costs. Wasted energy from inefficient lighting costs us between $1 and $2 billion a year, according to IDA. The city of San Diego, which installed new, high-efficiency street lights after passing a light pollution law in 1985, now saves about $3 million a year in energy costs. 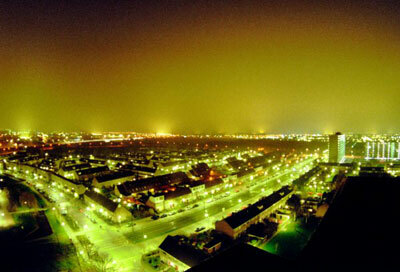 J Legislation isn’t the only answer to light pollution problems. Brian Greer, Central Ohio representative for the Ohio Light Pollution Advisory Council, says that education is just as important, if not more so. “There are some special situations where regulation is the only fix,” he says. “But the vast majority of bad lighting is simply the result of not knowing any better.” Simple actions like replacing old bulbs and fixtures with more efficient and better-designed ones can make a big difference in preserving the night sky.